Cathode Ray Tube present, THE ZOO STORY, by Edward Albee, at the Tap Gallery. Tue Oct 21 - Sat Oct 25. 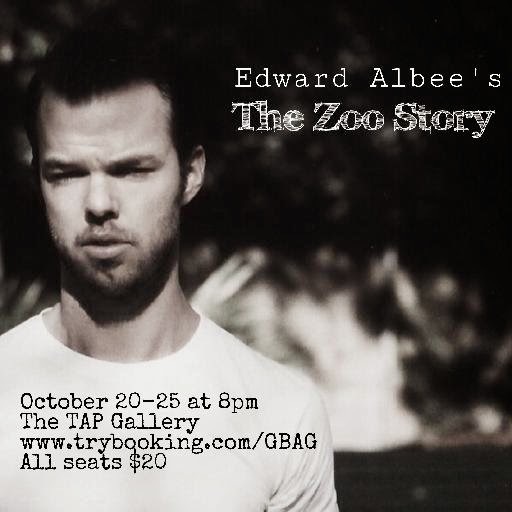 THE ZOO STORY, by Edward Albee, is a one act play, written in 1959, and was first performed in Berlin. It was Mr Albee's first, successful play. Since, it has become a staple in theatre repertoires around the world. Hearing it again, the other afternoon, at the Tap Gallery, was a pleasure, a treasure of the assurances that great writing can give to the dilemma of the existential question, that is often posed, whether, consciously or not, by all of us, "Is life worthwhile? To be, or not to be?" The exhilaration that I felt during, and after the performance of this play, the other afternoon, was a confirmation that it is, indeed, worthwhile and I would rather "Be" than not, while there is the possibility to be gratified by creative talents such as Mr Albee. The writing is a representation of a kind of genius that is man. "What a piece of work is man." Soon, after THE ZOO STORY was to come WHO'S AFRAID OF VIRGINIA WOOLF? (1962). Two men, Jerry (Michael Booth) and Peter (Oliver Wenn), meet in Central Park, New York, one afternoon. Only one of them leaves. Although apparently very realistic, the play, has being described as absurdist. The subsequent work of Mr Albee would vouch for his further exploration of the absurdities of being human and the possibility of the dimensions beyond the real. THE AMERICAN DREAM (196O), TINY ALICE (1964), BOX AND QUOTATIONS FROM CHAIRMAN MAO TSE-TUNG (1968), SEASCAPE (1974) - Pulitzer Prize winner, still not performed in Sydney. !!!! !, - THE LADY FROM DUBQUE (1977-1979), THREE TALL WOMEN (1990-91) - Pulitzer Prize - are, all, proof of such, poetic journeying, of a great consciousness and daring craftsman. Mr Albee in 2004, wrote a prequel to THE ZOO STORY and introduced a new character, Anne. In 2009, Mr Albee presented both these plays as, AT HOME AT THE ZOO: 1. HOMELIFE and 2. THE ZOO STORY. Professional companies must present both. Mr Albee declared he had, always felt that THE ZOO STORY was only a play for one and a half characters, and that he had a conscience about that, and so, in 2004, set out to address that. Amazingly, he said, the new play just poured out of him. He had been sitting on it, bottling it up, for forty odd years! Mr Booth has taken on the 'one character', Jerry, who hardly shuts up - the play is almost a monologue. Mr Booth's obvious 'love', his relish of the verbiage of Jerry is translated to us. For the most part - just a slight loss of concentration in the middle section - his ownership of it, the clarity of his storytelling imagination, keeps us stimulated and present in all the subtleties of not just Jerry, but also of the writer, Mr Albee. Mr Wenn, as declared, by Mr Albee, the 'half character', Peter, was a wonderful foil for Mr Booth, an active listener with a dense circumstantial inner monologue, accompanied with subtle secondary activities, guiding the audience to the proper responses for what unfolds on this afternoon in the park. However, both actors could have benefited with an outside eye, to Direct the growing narrative/dramatic ratcheting of tensions - this production was a replete enactment of the verbal text but lacked, relatively, the dramatic accumulations of the situation. Poetry it stayed, and not necessarily, the drama work written. There was, strangely, no Director for this production. It was a flaw to the afternoon. In New York, at present, Mr Albee's third Pulitzer Prize winner, A DELICATE BALANCE (1966), is in preview, with a stellar company that includes Glenn Close, John Lithgow, Lindsay Duncan, Bob Balaban, Clare Higgins and Martha Plimpton. What I would give to see it. It is playing for 18 weeks, till Feb. 22nd. The American Theatre Film (1973), Directed by Tony Richardson, with Katherine Hepburn, Paul Scofield, Lee Remick, Kate Reid, Joseph Cotton and Betsy Blair is a compensatory must see. Still, to hear THE ZOO STORY, the other afternoon, was a consolation and an appetite baiter. As you can detect, I believe Mr Albee to be one of our great living English speaking writers. N.B. Since this blog, news has come to light that the Tap Gallery Space has been closed. Tragedy, for some 20, or more productions will now be lost to the coming year's season. 20, or more opportunities for the young and poor artists to get work on. My first acquaintanceship with this play was in the 1970s, when, as a schoolboy, I saw a performance of it by the "Q Theatre", which at that time had a unique status in Sydney as a 'lunchtime theatre': office workers, department-store shoppers, builders-labourers, ladies who lunched and the odd schoolkid on holidays could hurry in to a theatre within the original AMP Building at Circular Quay, buy a sandwich and a ticket, see a play maybe by Brian Friel or Pinter and be out in time to resume work or play a happy hour later. The Q's production of "Zoo Story" was probably my introduction to the work of Edward Albee- and I left it delighted that the door had been flung open. It was funny, intriguing, finally shocking, and I have a clear image in my memory of the two actors in it, though I am only sure of the name of one of them - Kit Taylor, who played Jerry. At the time I felt that they had given excellent performances. To see the play again at the Tap Gallery is to feel once again its power. Albee sets up such a simple scene, and then with the economy, wit and bursts of ferocious imagery that by now are almost synonymous with his name, shows what...might happen when a dangerous individual breaks normal boundaries and enfolds a reluctant participant into his world. The actors at The Tap proved worthy inheritors of the roles; one left with a sense of having seen deep into two people, and it is a mark of their quality that within the story when a mask fell, or a barrier was rudely breached, the strong emotion that broke through never felt forced or overplayed. If there was a surprise for me, it lay in Mr Booth's slow burn...he began with such soft tone, and now and then returned to it; raising and lowering the pressure on his uneasy partner and often staying so eerily soft that I feared for a moment that he might lose us. But with considerable skill Mr Booth lit the rocket within himself and there was no way we could miss the inevitable descent.